Debuting April 1, 2014, Three-Disc Blu-ray(TM) Combo Pack is Ready for Primetime with THREE Versions of the Film, Including--in a Home Entertainment First--the Super-Sized R-Rated Version with 763 New Jokes, Plus More Than Four Hours of Bonus Features! HOLLYWOOD, Calif. - Called "hilarious" (A.O. Scott, New York Times), "fall-down funny" (Peter Travers, Rolling Stone) and just plain "awesome" (Claudia Puig, USA Today), "the funniest movie of the year" (Drew Taylor, AOL Moviefone) makes its highly-anticipated home entertainment debut when Anchorman 2: The Legend Continues arrives April 1, 2014 on Blu-ray Combo Pack, DVD and VOD from Paramount Home Media Distribution. Fans can be the first to own either the Theatrical Version or the Unrated Version when they arrive on Digital on March 11. 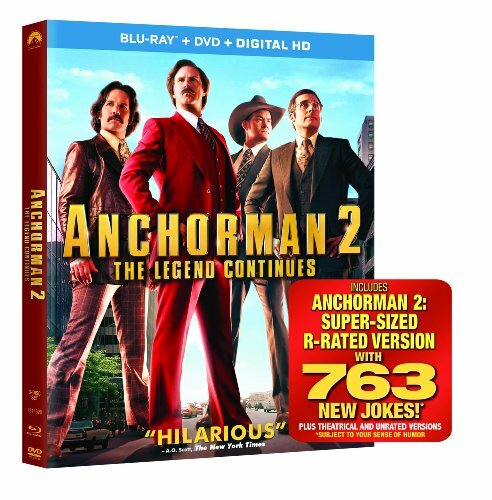 The Anchorman 2: The Legend Continues Blu-ray Combo Pack includes THREE versions of the film--the original Theatrical Version, the Unrated Version and, in a home entertainment first, the Super-Sized R-Rated Version with 763 new jokes! Never before in the history of home entertainment has anyone replaced 763 jokes. This must-own three-disc set also features OVER FOUR HOURS of bonus content including commentary by Adam McKay, Judd Apatow, Will Ferrell, Steve Carell, Paul Rudd and David Koechner, gag reels, more than 90 minutes of deleted, extended and alternate scenes, five behind-the-scenes featurettes, table reads, cast auditions and much, much more. "Not since the Beatles have four men assembled so brilliantly" (Mark S. Allen, �CBS-TV) as Will Ferrell, Steve Carell, Paul Rudd and David Koechner who reprise their now iconic roles to take on the 80s and the first 24-hour news channel. Featuring �Christina Applegate, Meagan Good, James Marsden and a host of hilarious celebrity cameos, ANCHORMAN 2: THE LEGEND CONTINUES achieved the rare feat of surpassing its predecessor to earn more than $125 million at the domestic box office. Paramount Pictures presents a Gary Sanchez/Apatow Production of an Adam McKay film: "Anchorman 2: The Legend Continues." Executive Produced by David Householter, Kevin Messick, and Jessica Elbaum. Produced by Judd Apatow, Will Ferrell and Adam McKay. Written by Will Ferrell & Adam McKay. Directed by Adam McKay.